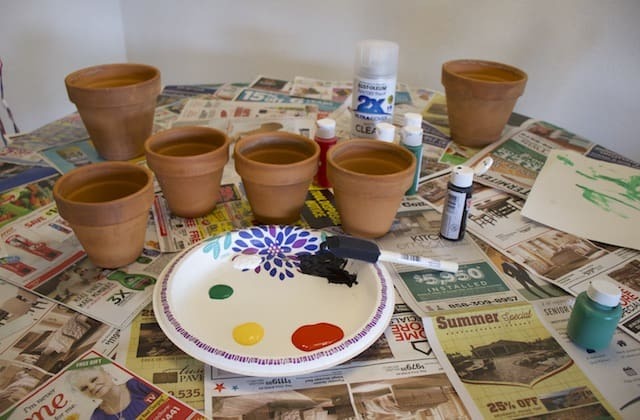 Painting terracotta pots is a fun way to add color to your home or garden. In this tutorial for how to paint terracotta pots you’ll also learn: what paint to use on terracotta plant pots, how to prepare your pots for painting, and how to seal clay pots. Tired of the traditional look of terracotta plant pots? Spice them up with a fresh coat of paint. Add a bit of color to your garden by adding hand painted plant pots that fit your style. Or create a cute theme for your indoor herb garden by painting a matching set. 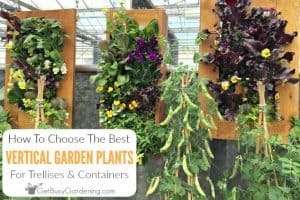 You could even give a thoughtful, personalized gift by potting up a houseplant that you propagated from your indoor plants, and paint the pot to go with it. Mix and match colors, designs, and patterns. You can do whatever your creative mind thinks up. 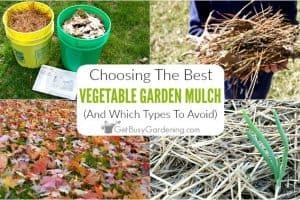 The options and possibilities really are endless, and they are all budget-friendly. 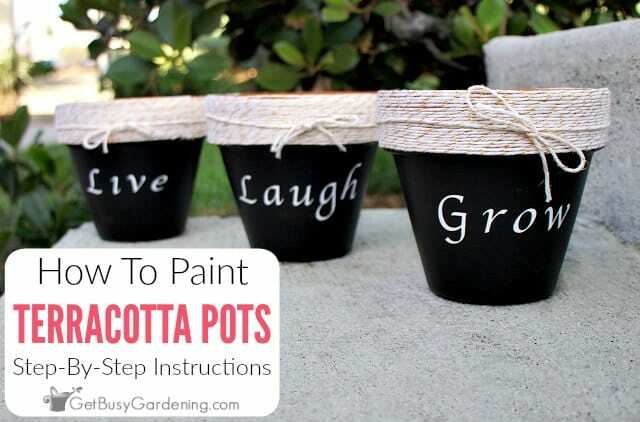 But there are a few things to do before you start painting terracotta pots. So, before I jump into the steps, let’s talk about what kind of paint to use, how to prepare clay pots for painting, and whether or not you need to seal your pots before painting them. Then I will show you the exact steps I use for my method of painting clay pots. 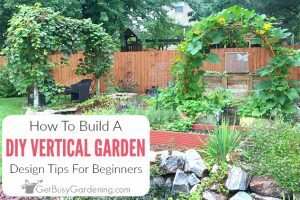 This method will work whether you want to paint large terracotta flower pots, mini terracotta pots, or any size in between. The best paint to use on clay pots… well, I’m not sure if there is only one type of paint that is considered the best. In my experience, acrylic and spray paint are both paints suitable for terracotta pots. For this project, I’ll be painting terracotta pots with acrylic craft paint. 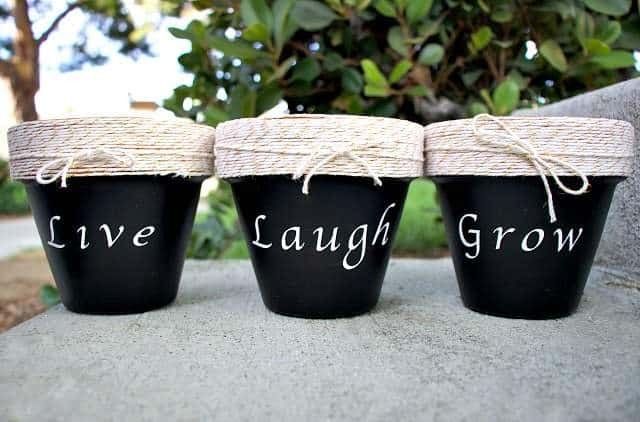 But I have used spray paint for clay pots before too, and it works just as well. So, go with the type of paint you prefer to use, or use whatever you have on hand. The first step you will take before painting terracotta pots is to clean them. If you buy clay pots that are brand new, run them under water and lightly scrub them with a cleaning brush or a pot brush before painting them. You don’t want any residue or powder on the pot – the paint will look lumpy if the pots aren’t clean. If you want to paint old terracotta pots (which is what I did), you definitely need to clean them so the paint will stick and look its best. Clay pots can look pretty rugged if they’ve been used before. They are incredibly easy to clean though, so take the extra 30 minutes and follow the steps for how to clean terracotta pots before painting them. Whether used or new, ensure your pots are COMPLETELY dry before starting to paint them. Terracotta clay planters really soak up the moisture, so it may take awhile. I let mine dry overnight, but you may find it takes a day or two for yours to dry. You can set them in the sun to help speed up the process. 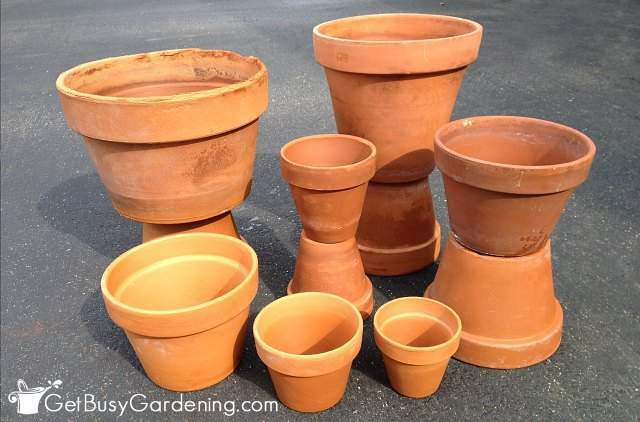 Do You Need To Seal Terracotta Pots Before Painting? Sealing terracotta pots for painting is an optional step, and it’s totally up to you if you want to do it. If you’re painting terracotta pots for outdoor use, then using a clay pot sealer before painting them will help the paint last longer. On the flip side, if you want your pots to get a nice aged look over time, then don’t seal them first. Waterproofing clay pots affects their breathability. 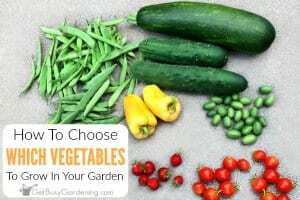 That means that the soil will retain moisture much longer than it would in an untreated pot. Keep this in mind if you’re used to growing plants in plain terracotta pots, so that you don’t end up overwatering your plants. Rather than sealing them before painting, you could use a paint primer for terracotta pots, which will help the paint last longer too. Water based primers won’t completely seal the pot, which will allow it to breath better than it can when completely sealed. One you’re done painting your pots, I definitely recommend using spray sealer over the paint to protect your hard work. This won’t completely seal the pots, so they will still be able to breath. It just adds a layer of protection over your paint job. You can simply use a spray on sealer, which you can get in a clear matte or clear gloss finish. 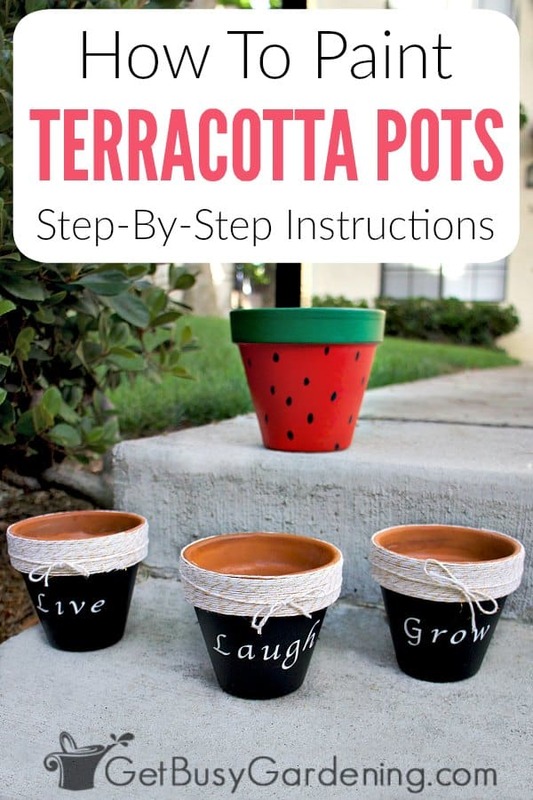 Ok, now let’s jump into the steps for painting terracotta pots! For my project, I decided to paint a matching set of pots for my indoor herbs. I have a collection of old pots that have been sitting around in my garage, so I selected four 6-in terracotta clay pots. Then I cleaned them up, painted them, added a bit of additional decor, and voilà. The cutest set of terracotta herb pots you’ve ever seen! Decorations (optional): decorative twine, regular twine, yarn, beads, buttons, letter stickers, stencils, etc. Step 1: Prepare clay pots for painting – As I mentioned above, whether you’re using old clay pots or brand new ones, you’ll want to clean them before painting them. Use your scrub brush or pot brush to get all the dust and dirt off, then allow them to dry completely before moving on to the next step. 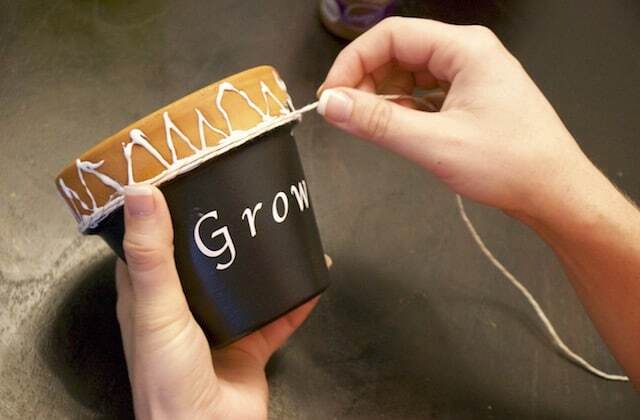 Depending on the size of the pot, it can take anywhere from overnight to a few days for the pots to dry completely. 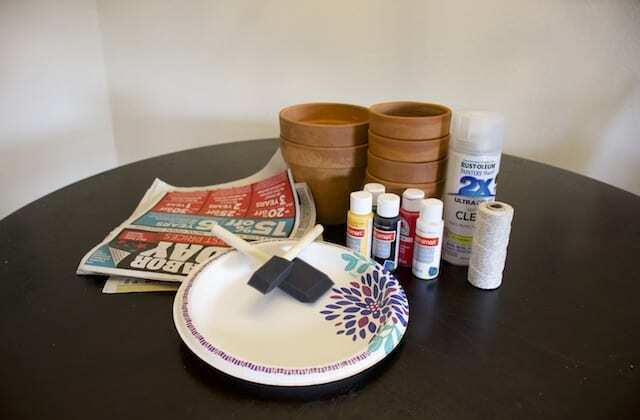 Step 2: Set up your workspace – Lay down newspaper where you will be painting terracotta pots. Even with a careful hand, it’s hard to paint a pot without getting a little paint on the surface you are working on – you have to set the pot down eventually. Step 3: Thin your paint (optional) – This is an optional step, but it really helps spread the paint over the pot when applying the base coat. Terracotta clay plant pots can really soak up the paint, so thinning it out with a little water helps spread it quickly and easily. Squirt a decent amount of paint on a paper plate. Add a very small amount of water (start with a teaspoon) to the paint and carefully mix it together using your foam sponge paint brush. Keep in mind that the water will change the color of the paint slightly. You don’t want your paint too thin or it will run right off the pot. 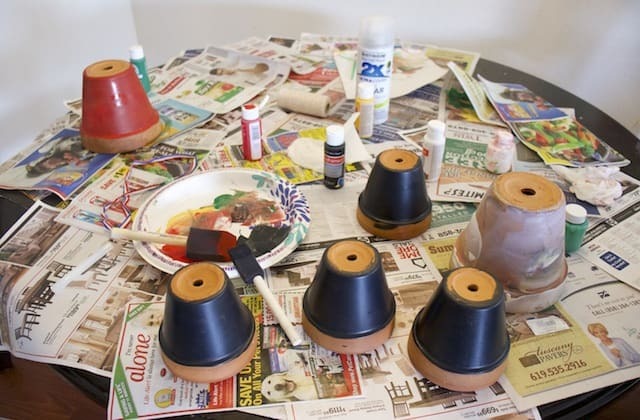 Step 4: Paint your pots – Use your foam sponge brush to paint the base coat. After you have your base coat on the terracotta pot, use non-thinned paint to add 2-3 additional coats. How many coats you use depends on the quality of your paint, if you want any of the pot showing through, and what color paint you are using. You don’t have to wait for the paint to dry completely in between coats, but should let it dry at least 75% of the way before adding more paint. It will be sticky to the touch, but not wet. Also, note that you don’t need to paint the very bottom of your pot since no one will see it. The inside doesn’t need to be painted either. But if you want to paint the top inch or two on the inside of the pot, that will cover the part that soil doesn’t. 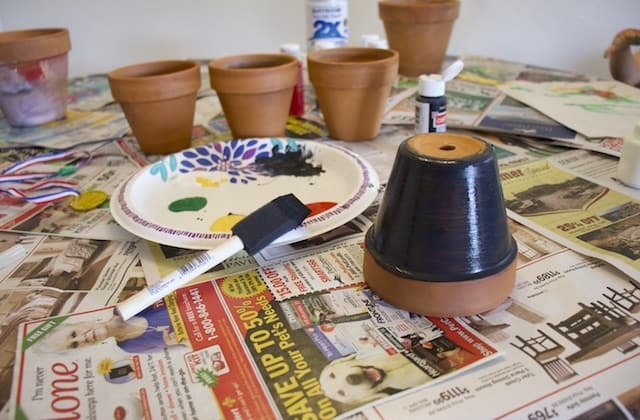 Step 5: Decorate your pots (optional) – Decorating terracotta pots is fun, and there tons of things you could do to give your pots even more pizazz. I added some decorative twine to the top of my painted herb pots for a little texture, and adhered it onto the pot using all-purpose crafting glue. I also added letters that I cut out with my Cricut (a hobby/craft machine that cuts materials like paper, vinyl, leather, and more) to make a matching set. The letters are made of vinyl material that is sticky on one side. Once I cut them, they stuck perfectly on the pot…just like a sticker. Instead, you could hand paint the words, or use stencils if you prefer. 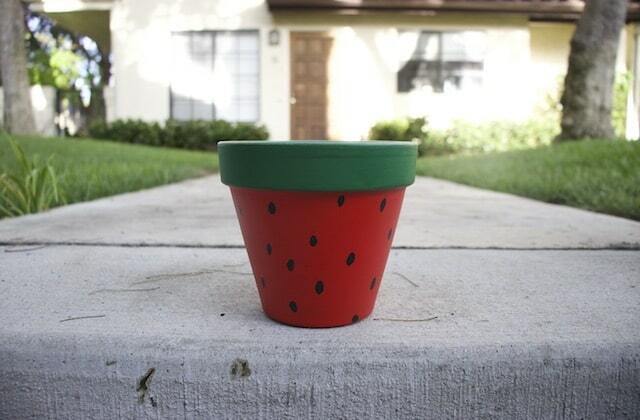 You could also come up with some fun painting designs for your DIY painted flower pots, like I did with my cute watermelon pot. To create this design, I used two different paint colors and then added some black dots for the seeds. Step 6: Let them dry – It’s very important that your painted plant pots are completely dry before moving on to the next step. This might take longer than you think. Terracotta clay flower pots absorb water and paint, so give them at least 24 hours before you decide they are dry. The thicker the paint, the longer you should allow them to dry. Step 7: Seal the paint – You don’t want all of your hard work to get chipped or scratched, so it’s a good idea to seal terracotta pots with a clear coat after painting them. I used a matte finish for mine, but you could use one with a glossy finish if you like that look better. Spray the pot according to the directions on the can. Painting terracotta pots is such a fun project to add color and your own personal style to your home or garden. Whether you want to make super fancy terracotta pots, or use simple clay pot painting designs, the possibilities are endless! Whatever type of decorative plant pots you decide to design, just remember that it’s an original creation, made by you. And that’s the best part! Share your tips for painting terracotta pots, or add your flower pot painting ideas in the comments section below. After I use watered-down paint primer for the base coat and add 2 additional coats without water, can I use tempera paints to paint designs and then seal it with a glossy clear coat spray? I’m not sure if you can use tempera paint over the water-based primer paint. Tempera paint is cheaper to buy for a class of 23 students. I need a quick response if possible please. Humm… I’ve never tried using tempera paint on my terracotta pots so I’m not sure. Sorry.